Garcinia cambogia is an exotic fruit, which is popularly used in the food industries, besides this is also very effective in the treatment of various diseases and disorders such as edema (accumulation of fluid in the body), constipation, piles, rheumatism, intestinal parasites irregular menstruation, cancer and high lipid levels. Different plant parts of garcinia cambogia contain different health promoting compounds. Such composition makes it extremely healthy and useful in the treatment of various ailments. Recently a lot of light was thrown on the role of garcinia cambogia on weight loss. It is still surrounded by many controversies, but some studies have successfully shown its positive role. Commercial products that contain garcinia cambogia are also available in the market and they have received both positive and negative feedback. Garcinia cambogia is a supplement that has gained a lot of popularity in the past 8 to 10 years. The main reason behind its popularity is its ability to promote weight loss. It is also known as an anti-obesity supplement. It is very commonly available in the form of pills or capsules. What is Garcinia Cambogia Fruit? Garcinia cambogia extract is produced by extracting an active principle from its rind, fruit or roots. Solvent is used to release the active compounds present in garcinia cambogia. Extracts are usually made with either glycerin or ethanol (alcohol). Hydroxycitric acid (active compound) is extracted from garcinia cambogia fruit and it is usually available in the market in form of supplements (pills). Many different companies manufacture garcinia cambogia extract supplements. It is usually claimed that extracts are more effective than the whole plant. What is Garcinia Cambogia HCA? HCA is hydroxycitric acid, which is the most active principle in garcinia cambogia. It is a derivative of citric acid and is commonly found in plant species, which are native to South Asia. 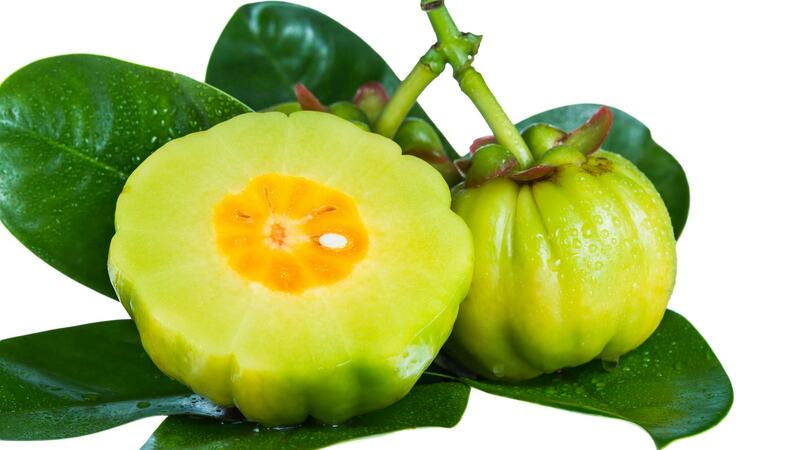 For the first time in nature, HCA is found in garcinia cambogia fruit. It constitutes approximately 20-30% of the fruit, on dry weight basis. It is very similar to citric acid, which is present in lemons. Several studies have found that hydroxycitric acid is safe to use and has no side effects up to 2800 milligrams per day. It is mostly marketed as a weight loss supplement and many studies claim that HCA when used alone or in combination with other supplements helps in weight loss. Garcinia cambogia fruit, seeds, roots, leaves as well as their extracts possess medicinal value and they are useful in the treatment of various diseases and disorders. Besides the presence of hydroxycitric acid, garcinia cambogia contains various other compounds that are beneficial for health. Such a composition makes it very different from other fruits. It is used to treat abdominal pain, abdominal infections and certain liver disorders. In Ayurveda, it is believed that garcinia cambogia stimulates digestive juices and thus aids digestion. However, Research has further also showed that very high dose of hydroxycitric acid can be life threatening. Approximately 30% of these compounds are present in the flesh of garcinia cambogia fruit. Studies have shown that these health-promoting compounds play an important role in weight loss, regulate fatty acid synthesis, and suppress appetite. Some studies have found that POLYISOPRENYLATED BENZOPHENONES present in garcinia cambogia have anti-HIV and anti-bacterial effect and it also inhibits the action of harmful toxins and thus, protects the cell against damage. Furthermore, it even possesses antibiotic and anti-ulcer activities and modulates gene expression. It also has anti-inflammatory and anti-cancer properties and thus, helps in the treatment of cancer. An imbalance between production of reactive oxygen species and inability of antioxidants to scavenge them leads to oxidative stress. This oxidative stress plays an important role in the development and progression of various diseases and disorders such as type 2 diabetes mellitus, arthritis, cardiovascular diseases, cancer, cataracts, Alzheimer’s disease and so on. Garcinia cambogia is a rich source of antioxidants that fights oxidative stress and prevents the onset of diseases and disorders. A recent study observed the antioxidant property of garcinia cambogia. Extract of garcinia cambogia has the ability to neutralize harmful free radicals and it further inhibited the formation of reactive oxygen species. Thus, it can be said that garcinia cambogia extract prevents the onset of oxidative stress. It was further showed that antioxidants present in garcinia cambogia suppressed the activity of reactive oxygen species and thus, reduced the level of oxidative stress. Besides that a strong scavenging ability, garcinia cambogia has a strong reducing ability too. This reducing ability is associated with breakdown of free radical chain. Such an antioxidant property is due to the presence of hydroxycitric acid, flavonoids and tannins in garcinia cambogia. Fruits and leaves of garcinia cambogia have strong anti-bacterial and anthelmintic (expel the parasites) properties and they help in the treatment of various bacterial infections. Research has found that both garcinia cambogia fruit as well as its extract exhibit anthelmintic properties and throw parasites out of the body. Garcinia cambogia works by inhibiting the mobility of bacteria and parasites and thus, it reduces their action. Higher doses were more effective as an anthelmintic against gastrointestinal worms. Garcinia cambogia fruit and leaves exhibit strong anti-bacterial property against gram positive and gram-negative bacteria. Furthermore, biologically active compounds inhibit the growth of bacteria and thus, keep infections at bay. A recent study showed antibacterial activity of garcinia cambogia fruit against E. coli, S. aures and P. aeruginosa. It killed the cells infected with bacteria and thus, reduced the overall infection. Another study published in 2013 showed that garcinia cambogia fruit extract had anti-bacterial activity and it inhibited growth of microorganisms. Therefore, such a property of garcinia cambogia protects against a number of gut-illnesses. Garcinia cambogia is highly valued for its medicinal properties and it is specially used for weight loss as well as fat loss. However, before starting garcinia cambogia supplement it is very important to consult your doctor or health-care provider. It is found that garcinia cambogia plays a very important role in weight loss. It has been widely used as an anti-obesity or weight loss supplement since decades. This property of garcinia cambogia is mainly due to presence of an active component called ‘hydroxycitric acid’ in it. Hydroxycitric acid inhibits the process of lipogenesis in which carbohydrate in converted to fat in the body. As this conversion is inhibited, body oxidizes carbohydrates and promotes glycogen storage. This in turn suppresses the appetite and thus decreases the body weight gain. In addition to this, hydroxycitric acid increases the production of serotonin in the brain, which further leads to appetite suppression. Serotonin is a natural appetite suppressant that curbs the hunger cravings and helps in weight loss. HCA derived from garcinia cambogia is an inhibitor of ATP citrate lyase. ATP citrate lyase is an important enzyme that makes the synthesis or formation of fatty acids, cholesterol and triglycerides easier. With inhibition of this enzyme, the production of fatty acid, cholesterol and triglyceride decreases which in turn reduces the total body fat content. A study published in 2004 showed that HCA derived from garcinia cambogia plays a successful and a safe role in weight management. In this study, individuals were given HCA-SX, that is, calcium-potassium salt of HCA derived from garcinia cambogia (providing 2800 milligrams of HCA) in 3 equally divided doses, 30 minutes to 1 hour before the meal. It was found that individuals who were given HCA-SX, their consumed food intake, total cholesterol levels and triglyceride levels reduced whereas, the level of HDL – high-density lipoprotein cholesterol (healthy) and serotonin (appetite-suppressant) increased. Besides this, the excretion of fat metabolites (products that remain after fat breakdown) in the urine increased which is an important marker of fat oxidation. Such an effect was not observed in individuals who did not receive HCA-SX. In another study, individuals received treatment with garcinia cambogia containing 1000 milligrams of HCA for 12 weeks. A significant reduction was found in visceral fat (fat within abdominal cavity), subcutaneous fat (fat stored under the skin) and total fat areas in individuals who received garcinia cambogia treatment whereas, individuals who did not receive this treatment did not show any decrease in their fat levels. Furthermore, a slight weight loss and drop in the body mass index (BMI) were observed at the end of 12 weeks. Thus, it can be said that garcinia cambogia is effective in reducing the belly fat and fat around other parts of the body. A study found that garcinia cambogia failed to produce effective results in fat loss and weight loss in obese individuals. In fact, group of individuals who did not receive garcinia cambogia treatment lost from weight as compared to individuals who underwent the treatment. Very few studies have found an effective role of garcinia cambogia on type 2 diabetes mellitus. Garcinia cambogia works on reducing the insulin resistance and improves the peripheral insulin sensitivity. Such effect increases the transport of glucose to cells and muscles and reduces the concentration of glucose and the blood. Thus, it reduces hyperglycemia or high plasma glucose levels. One interesting study showed that garcinia cambogia had an indirect effect on plasma glucose levels. Treatment with 3.3% of garcinia cambogia extract improved glucose metabolism and increased the uptake of glucose by cells. This increased the use of glucose as a source of energy for the body and reduced the amount of glucose in the blood. Thus, it in turn reduced hyperglycemia and helped in the management of blood glucose level. Another research published in 2007 found the positive role of garcinia cambogia extract on management of plasma glucose level. The effect of a calcium-potassium salt of hydroxycitric acid extracted from dried rind of garcinia cambogia fruit was observed. It was found that such an extract reduced the level of oxidative stress in the pancreas and thus, helped in reducing high plasma glucose level. Administration of such an extract further reduced the marker of oxidative stress such as MALONDIALDEHYDE. It further reduced the level of insulin resistance and inflammation. High visceral fat mass plays an important role in the development of insulin resistance and high plasma glucose levels, thus leading to type 2 diabetes mellitus. Visceral fat is the fat around abdominal cavity and organs. Central obesity has shown to have direct relationship with increased risk of diabetes mellitus. Research has shown that garcinia cambogia extract reduces the level of visceral fat, subcutaneous fat as well as total body fat mass. Such a reduction in visceral fat mass reduces the level of insulin resistance and makes insulin more sensitive to the action of insulin. Research further showed that treatment with high dose of HCA containing garcinia cambogia suppressed the fat accumulation whereas, no effect on fat was observed in a group, which did not receive the treatment. Thus, it can be said that garcinia cambogia extract plays an important role in the management of diabetes mellitus; however, more trials on human are required to confirm its positive effect. Many scientific studies have found that garcinia cambogia works on reducing high cholesterol and triglyceride levels. Garcinia cambogia extract works by inhibiting the activity of ATP lyase, an enzyme that plays a very important role in the manufacture of fat in the body. Such an inhibition reduces the amount of fat in the body and further reduces the formation of cholesterol and triglycerides. It further suppresses the formation of fat in the liver, adipose tissue and intestine. Flavonoids present in garcinia cambogia also play a beneficial role in lowering high cholesterol and triglyceride level. Flavonoids are health-promoting compounds present in plants. Such a positive effect is due to the presence of two flavonoids – TANNIC ACID and MORIN that cause favorable changes in lipid profile. Flavonoids reduced the activity of enzymes that plays an important role in the manufacture of cholesterol. Such a reduction further decreased the production of cholesterol and thus, less cholesterol was formed in the body. Furthermore, the level of high-density lipoprotein (HDL) cholesterol (healthy) increased significantly and the level of low-density lipoprotein (LDL) cholesterol and very low-density lipoprotein (VLDL) cholesterol (unhealthy) declined. Cholesterol is required for the synthesis of bile acid. Garcinia cambogia extract increases the excretion of bile acid. Thus, more cholesterol will be required for the formation of bile acid. Such a continuous cycle of bile acid excretion, reduces the level of cholesterol in the body. A study showed that presence of hydroxycitric acid, an important organic acid in garcinia cambogia has hypolipidemic properties and is a powerful lipid-lowering agent. It induces change in fat metabolism, that is, more fat is used as a source of energy and less is stored in the body. It further converts excess fat into glucose, which is stored in the liver in the form of glycogen. In addition to this, it also alters the activity of various enzymes that participate in breakdown the excretion of fat. Such a lipid-lowering effect further significantly declined the risk of cardiovascular diseases. Therefore, it can be concluded that garcinia cambogia extract offers promising therapeutic effect in lowering high cholesterol and triglyceride levels and it further provides protection to the heart. Garcinia cambogia is very effective in the treatment of gastrointestinal disorders. It soothes the inner lining of the gastrointestinal tract and reduces the inflammation. A research showed that oral treatment with garcinia cambogia fruit extract for 5, 10 or 15 days protected the inner lining of the stomach against damage caused by drug (indomethacin). It further reduced the acidity and volume of gastric acid (digestive fluid) and thus, reduced the overall inflammation. In addition to this, it reduced acidity and increased the defense in the gastric areas. During gastric ulcer the level of oxidative stress, free radical damage and inflammation increases which further deteriorates the condition. Therefore, it becomes very important to control these levels. A study showed that garcinia cambogia extract reduced the level of oxidative stress in the gastrointestinal tract and decreased the markers of inflammation. It further inhibited gastric lesion and improved the gastric blood flow. An increase in the blood flow provides more nutrients and oxygen and thus nourishes the gastric area. In addition to this, it also increased the secretion of mucus, a viscous substance that protects the inner lining of the gastrointestinal tract against the harmful action of acid. Garcinia cambogia extract reduces the adhesion of harmful substances to the gastric area and accelerates healing of ulcer. It also reduced the acid output by increasing the pH of gastric juice so that it does not irritate the inner lining and aggravate the condition. Many diseases are associated with high levels of inflammation. Therefore, it becomes very important to lower the level of inflammation in order to treat the disease. Inflammatory bowel disease (IBD) is one such disorder in which inflammation in the gastrointestinal tract increases. One research has shown that garcinia cambogia has attracted a lot of interest in the treatment of inflammatory bowel disease due to its gastro-protective effect. Garcinia cambogia extract has a medicine-like effect that reduces the markers of inflammation. Tests showed that treatment with garcinia cambogia extract reduced the gastrointestinal damage and increased the level of antioxidants that further protected against inflammation. It further improved several parameters related to the disease. Thus, garcinia cambogia extract is very useful in the treatment of inflammatory bowel disease. Excess high fat intake increases the amount of fat in the body, elevates cholesterol level and also leads to increase in the level of inflammation. Adipocytes (cells that store fat) increase the production of pro-inflammatory cytokines and thus increase the overall state of inflammation. The presence of health promoting compounds in garcinia cambogia such as xanthones, flavonoids, and benzophenones possess antioxidant and anti-inflammatory properties. In addition to this, hydroxycitric acid present in garcinia cambogia also reduces inflammation. In some diseases and disorders, water may get accumulated in the body, this is known as edema. Diuretics are a class of drugs, which are given to individuals with edema so as to increase their urine output. This reduces the extra amount of water and electrolytes, which get accumulated in the body. One study observed diuretic properties of garcinia cambogia leaf extract in rats. Garcinia cambogia leaf extract produced a diuretic effect and increased the volume of urine output as well as increased the excretion of electrolytes such as sodium, potassium, and chloride. An increase in the level of electrolytes can lead to various disorders, which may be life threatening too. Active principles found in garcinia cambogia leaves that are responsible for its diuretic activity include flavonoids and glycosides. Thus, leaves of garcinia cambogia can be used for the treatment of edema. Garcinia cambogia may lead to liver-toxicity and may further damage the liver. A study found that garcinia cambogia increases the accumulation of collagen in liver as well as elevates the markers of inflammation such as TNF-α. Accumulation of collagen alters the normal structure and function of a healthy liver. Furthermore, it impaired the liver function and increased the level of enzymes in the blood. This clearly suggests that garcinia cambogia causes liver injury. However, more trials on human are required to confirm such side effect of garcinia cambogia. An experimental study performed on rabbit showed that topical application of 500 milligrams of hydroxycitric acid, an important component of garcinia cambogia, on skin leads to irritation of skin. In addition to this, the site of the skin where hydroxycitric acid was applied turned yellow in color. However, more animal as well as human studies are required to know and confirm the effect of topical hydroxycitric acid application. Research has shown that administration of garcinia cambogia seed extract is an anti-thrombotic agent that inhibits the clot formation, increases the bleeding time, and reduces the clotting time. It also reduced the amount of circulating platelets in the blood and reduced the tendency for the blood to coagulate. In addition to this, the ability of garcinia cambogia seed extract as a blood thinner was equal to aspirin. A study published in 2003 observed the safety of garcinia cambogia in healthy individuals for 12 weeks. These individuals were given 5000 milligrams of garcinia cambogia extract powder, which is equivalent to 3000 milligrams of hydroxycitric acid. Different blood parameters were checked during the start and end of this study. Blood parameters that were analyzed include: Hematology (Hemoglobin, WBC, RBC, hematocrit and platelets), triglycerides, free fatty acids, total cholesterol, low density lipoprotein cholesterol (LDL), high density lipoprotein cholesterol (HDL), total bilirubin, blood urea nitrogen, ketone bodies, creatinine, enzyme levels, a complete urine analysis and reproductive hormones. At the end of the study, very small changes were observed in the liver enzyme level, but this did not alter function of the liver. No other differences were observed and it was concluded that garcinia cambogia is safe to use. Few studies observed that treatment with garcinia cambogia extract brought up certain changes in the level of reproductive hormones, but no reproductive disorder or dysfunction is observed yet. Many animal as well as human studies have clearly shown that garcinia cambogia extract is useful in weight loss as well as fat loss, but not all studies show the same results. In addition to this, studies conducted on garcinia cambogia are short term that is none of the studies conducted are beyond 12 weeks. None of them has shown whether its effects after 12 weeks persist. Furthermore, safety in administration of garcinia cambogia for a long period remains unknown. More long-term trails are required to understand a complete effect of garcinia cambogia and its safety profile. Blood thinners are drugs that inhibit formation of clots. Research has showed that garcinia cambogia seed extract has anti-thrombotic properties (inhibits formation of clots) and it increases the bleeding time. If blood thinners are taken with garcinia cambogia or if the time gap between their intakes is less, it may lead to excessive bleeding. Therefore, it is better to avoid intake of blood thinners and garcinia cambogia together. Garcinia cambogia extract is a good anti-diabetic agent that helps to lower plasma glucose levels. Taking garcinia cambogia extract with anti-diabetic drug may lower the plasma glucose level beyond normal range and may lead to hypoglycemia. As garcinia cambogia extract slows down conversion of carbohydrates to glucose, taking it along with anti-diabetic drug or maintaining very less time between their intakes may drop the plasma glucose levels beyond normal. Garcinia cambogia extract is very effective in lowering low-density lipoprotein (LDL) cholesterol and total cholesterol levels. Taking it with cholesterol lowering drug may lower the levels of cholesterol beyond the normal range. Having very little amount of cholesterol in the body is also not good as cholesterol is required for normal cell functioning and for the formation of certain hormones. Garcinia cambogia increases the level of serotonin. Serotonin is a neurotransmitter that conducts messages between nerves. Serotonin makes you feel good, improves your mood as well as social interactions. Anti-depressants such as selective serotonin re-uptake inhibitors (SSRI) may interact with garcinia cambogia and may have an effect on central nervous system. Sun-dried smoked rind of garcinia cambogia is very popular as a spice condiment and is widely used in fish curries. Dried rind of garcinia cambogia fruit when combined with salt can be used to treat fish. This combination is mainly used in India and Sri Lanka. Its dried rind kills the bacteria and thus, improves the shelf life of fish. It is also used as a bulking agent, which makes the meals more filling, and thus, reduces hunger pangs. Due to its high vitamin C content, a tonic is prepared out of garcinia cambogia fruits, which helps to prevent heart diseases. Rind of garcinia cambogia fruit can be used in curries instead of tamarind and lemon. Garcinia cambogia extract is very commonly used in the form of pills for weight loss. Garcinia cambogia extract is also used in the powdered form. Decoction of rind is given during bowel complaints. Garcinia is the largest genus and it belongs to the family CLUSIACEAE that comprises of approximately 390 different species. Out of all, garcinia cambogia is highly valued for its medicinal properties. Its tree is usually small to moderate in size and it grows up to 12 meters. The leaves are dark green in color and they have a shiny appearance. The length of the leaves ranges from 5 to 16 centimeters. Garcinia cambogia tree is found in India, Sri Lanka and Nepal. Besides this, garcinia cambogia is also distributed to in sub-tropical regions of Asia such as China, Philippines and Malaysia. The trees grow well on both plain lands as well as hill tops and are found mainly in semi-evergreen to evergreen forests of Southwest India, mostly in the Western Ghats- Tamil Nadu, Maharashtra, Kerala and Karnataka. Besides India, it is also found in Nigeria, Cameroon, Ghana, Ivory Coast, Liberia and Sierra Leone. Garcinia cambogia grows best in dry or even flooded (waterlogged) soils in rivers and valleys. Up to what dosage is garcinia cambogia safe? HCA is the active compound found in garcinia cambogia. The research found that no side effects were observed up to 2800 to 3000 milligrams of HCA. What is the best time to take garcinia cambogia? The effect of HCA is maximized when garcinia cambogia is taken 30 minutes to 1 hour before the meals. Can a pregnant woman or lactating mother take garcinia cambogia? It is better to avoid garcinia cambogia during pregnancy as research is still lacking about its safety during pregnancy and lactation. Are there any side effects or symptoms observed after taking garcinia cambogia? Yes, fever, headache, common cold, nausea, and nosebleed are some common symptoms, which were observed in a study when healthy individuals were treated with garcinia cambogia extract powder. Which forms garcinia cambogia supplements are available in the market? Garcinia cambogia supplements are available in the form of pills (tablets or capsules) or in the liquid form. If you have any medical condition, ask your doctor or health-care provider before starting with garcinia cambogia supplement. If there are any symptoms or side effects, immediately stop taking garcinia cambogia supplement and seek medical advice. Maintain a huge time gap (minimum 3 hours gap) between garcinia cambogia supplements and other drugs. In summary, it can be stated that garcinia cambogia is effective in reducing body weight and body fat. Besides this it is also effective is lowering the level of plasma glucose level, cholesterol level as well as triglyceride levels. Treatment with garcinia cambogia combats oxidative stress and drops the level of inflammation. All these benefits of garcinia cambogia are due to the presence of an active compound in it called ‘hydroxycitric acid’. However, more studies on human are required to check its safety during the long-term use. As most of the studies have only been conducted studies for 12 weeks, nothing can be concluded about its safety as well as toxicity.